Compared to Franz Schubert's two 'true' song cycles, Die schöne Müllerin and Winterreise, Schwanengesang poses far more questions – to performers, listeners and musicologists alike. It is in fact a compilation of two different sets of songs to texts by Ludwig Rellstab (seven songs) and Heinrich Heine (six). In his manuscript, dated August 1828, Schubert wrote out the songs without any title page or numbering. Following the composer's death three months later, the publisher Tobias Haslinger added the single song Die Taubenpost, written in October 1828, and brought out the posthumous collection entitled, appropriately, 'Swan Song'. How, or indeed if, Schubert himself intended to combine these songs, we do not know. The four miscellaneous songs which close this programme serve as a further demonstration of the astonishing versatility of their maker and his boundless musical resourcefulness. 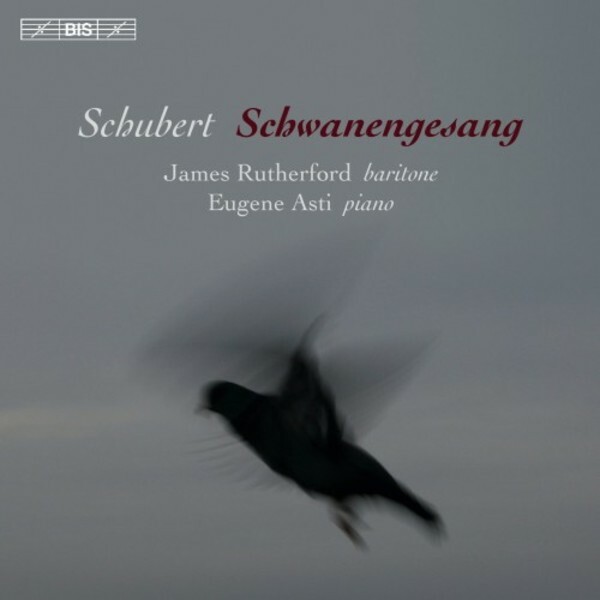 During the 15 years that they have collaborated on these songs, James Rutherford and Eugene Asti, have performed the cycle in many different formats, but for their recording of the collection they have decided to stay as close to the original as possible, with the exception of including Herbst, another Rellstab setting, from Schubert's final year. Schubert's manuscript is written for high voice, and Rutherford and Asti have chosen to transpose each song down a minor third – a seemingly obvious decision, but in fact this recording is one of the few, if not the only, by a baritone in which the original tonal relationships between the songs are retained.